See a gap, jump it. See a rail, vault over it. See a wall, climb it. These are the instincts of traceurs, adoptees of a French-inspired sport called parkour that is part obstacle course, part pushing the limits of urban architectural functionality and all adrenaline-pumping excitement. Where most people see walls and divisions, traceurs see opportunities for overcoming obstacles and barriers both physical and mental. Le Parkour (also called Parkour, PK) is a physical discipline of French origin in which participants attempt to pass obstacles in a smooth and rapid manner. Parkour is said to be l'art du déplacement, or the art of moving (from A to B), consisting of uninterrupted forward motion over, under, around and through obstacles (both man-made and natural) in one's environment. Such movement may come in the form of running, jumping, climbing and other more complicated techniques. The goal of the practice of parkour is to be able to adapt one's movement to any given situation so that any obstacle can be overcome with the human body's abilities. Practitioners of parkour are known as traceurs, a term of French origin. The names free running and free runner have been very frequently adopted by the English language media as a result of their use in the television documentary Jump London. Chug wishes all his family and friends Merry Christmas! Each Friday, A Guy In New York publishes "This Week in NYC Reviews (TWIR)," with quick links to New York City restaurant reviews and mentions from the previous seven days in blogs, magazines, and newspapers. This week's TWIR is truncated. The regular format returns January 6, 2006. Merry Christmas! Did we miss your favorite review? If you want to place a TWIR logo with a review that was featured, feel free to link to one of the banners on the TWIR page. "TWU Bad For Labor Nationally?" ...it does not bode well for Dems and labor when Blue State Ivy Leaguers react to strikes by saying that union chiefs should go to jail. Artprice.com, a French company that tracks world auction results, figures overall prices in New York and London topped their mid-1990 peak for the first time this year -- by 33% and 19%, respectively. Meanwhile, Chinese art often soared to four or five times pre-auction estimates at recent Sotheby's and Christie's Hong Kong sales. Indian and Russian works are seeing similar gains. Best blog posts of 2005? All submissions must be original material, although a post that is basically a link to another post will get a hat-tip acknowledgement. Welcome to the Big Apple Blog Festival (BABF), a representative roundup of this week's posts by NYC bloggers. mister snitch! links to a site where you can build an online snowman .. The Big Apple Blog Festival is listed on the ÜberCarnival page and in Carnival News. You are free to repost the Big Apple Blog Festival so long as you leave this URL attached: BigAppleBlogFestival.com. Loco lost between the bed linens ... the cat climbed up the white plastic shelvings in the closet ... what strength!!! Each Friday, A Guy In New York publishes "This Week in NYC Reviews (TWIR)," with quick links to New York City restaurant reviews and mentions from the previous seven days in blogs, magazines, and newspapers. Last week's Big Apple Blog Festival was hosted by Harleys, Cars, Girls & Guitars. This week's Big Apple Blog Festival is hosted by NYC Stories. An Englishman in New York reports on the Park Slope Food Coop and communism. mister snitch! from Hoboken blobs about blogging or not blogging. "The secret of blogging is not to blog at all." Then he asks about "Pajamas Media". "Did anyone else wince when, at their big NYC party, Roger Simon said they wanted to be the New York Times of blogging? Shouting Thomas at Harleys, Cars, Girls and Guitars brings us a look at the work going on at a Woodstock Tattoo parlor. Finally on the subject of work, Asymmetrical Information has been nominated for best business blog of 2005. See this week's BABF for much more. Next week's BABF will be hosted by A Guy In New York. To nominate your favorite blog post about NYC, or if you have a NYC blog and want to see something in the next BABF ... or you have a NYC-related blog and would like to host an upcoming BABF ... send us a short write up and a permalink to aguyinnewyork [at] gmail.com ... or use the Carnival Submit Form. After hearing so much about it, Gothamist finally decided to head up to the Bronx to check out the New York Botanical Garden's Holiday Train Show. 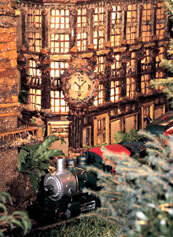 Inside the conservatories, there are replicas of various NYC buildings and landmarks, "made entirely from plant parts like berries, mushrooms, pinecones, and twigs," with model trains running through around, through and over them. 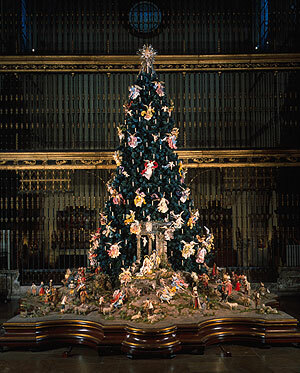 And Gothamist can say that the replicas are pretty incredible. 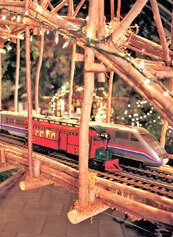 Holiday Train Show, through January 8, 2006, open Tuesdays–Sundays, 10:00 am – 6:00 pm, Tickets $16 - $5. All tickets specify an entry time to the Holiday Train Show. Please be on the Garden grounds at least 15 minutes before your specified entry time. This year's annual Grand Central Holiday Train Show consists of a newly created, 34 foot-long, "O gauge" train layout with model trains running on eight separate loop tracks through a wondrous holiday scene that begins in a living room on Christmas morning, then travels through a miniature New York City, across the HellGate Bridge, through suburbs, farmland, and on to the North Pole! In addition to the working holiday train layout, vintage Lionel model trains from the New York Transit Museum's Lawrence Scripps Wilkinson collection will be on display and, in honor of the 100th anniversary of motorized bus service in New York City, the exhibit will also feature an eye-catching assortment of toy buses. "Papering" and "Dressing the House"
For theater-lovers, learning some industry jargon couldn't hurt. "Papering the house," for example, is a common producers' practice to fill unsold seats. It's done during previews -- to start buzz about a new play, and assure a full house when critics are in attendance -- or when a show is past its prime and ticket sales dip. "We used to invite staff from fellow theater offices, sort of as a professional courtesy," says one theatrical company manager. "Now, no one wants to admit they're papering, so we're turning to sources outside the theatrical community." Organizations such as Audience Extras (AE), Play by Play and Theatermania.com's Gold Club collect lists of interested theatergoers. In exchange for an annual fee of $85 to $99, those individuals receive offers to Broadway, Off- and off Off-Broadway shows (sometimes on opening night) costing just $3 to $4.50 a ticket. Seeing a play for such a ridiculously small amount of money, however, is viewed as a privilege; in return, producers expect proper business attire, etiquette (no skipping out at intermission), and discretion (don't brag at the box office about the great deal you got, while others pick up their full-price tickets). You are, in a sense, working the show, providing the actors with a full and attentive audience, often as they try to iron out kinks in a new production. Audience Extras distributes complimentary tickets to it's subscribers when a show is in previews, under publicized, expecting a reviewer or celebrity to attend, or would like the benefit of a full house. As an Audience Extras subscriber you get to choose from over 1000 different events a year! 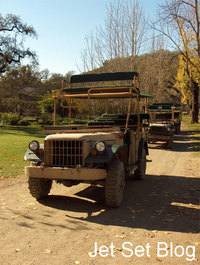 You can attend as many shows as you like for only $3.00 reservation service charge per ticket! A portion of the service charge goes directly to The Memorial Foundation for the Arts to aid non-profit theaters. Audience Extras (AE) is a "papering" system (i.e. provide additional audience to shows when needed) that was established by Mr. Peter Copani and his son John-Vincent to benefit the Performing Arts in three innovative ways. First, by screening for responsible, dependable and discreet people to put in an empty seat when a producer needs extra audience. Second, by distributing "paper" complimentary tickets in a way that could develop future audiences, that is, on a "free sample" introductory basis. The third benefit is to use the AE "papering" program as an ongoing funding source for non-profit theatre. The cost of the AE communication system is covered by the ticket recipients making it free for theatre companies and producers who use the service to "paper" or "Dress The House". Theater Extras is a “seat-filling audience development organization” only. We do not sell tickets. Theater Extras arranges COMPLIMENTARY tickets for its members when a performance or event is in previews, under publicized, expecting the attendance of reviewers or celebrities, or would like the benefits of a full house. Performances range from previews to opening nights to performances throughout a show’s run. Play by Play, a unique organization called upon by theatre producers to fill unsold seats to their Broadway and Off Broadway shows. Performances range from previews and opening nights to performances throughout a show's run. Corporate attire is required for Broadway shows. TheaterMania [Gold Club] works directly with producers, theaters, and venues to make tickets available for our members who discreetly fill the house and help build buzz and word of mouth for shows. Members log into the Gold Club, select shows and events from our exciting and diverse list of offerings, print a voucher, and present it to the box office. It's that simple! The membership pays for itself with one or two shows! the most amazing, creative and well executed Christmas lighting display I’ve ever seen. Prepare to be amazed. Update: According to Snopes, this was the 2004 Christmas light display of "Carson Williams, a Mason, Ohio, electrical engineer who spent about three hours sequencing the 88 Light-O-Rama channels that controlled the 16,000 Christmas lights in his annual holiday lighting spectacular." Even social-climbing New Yorkers, the most shameless name-droppers on the planet, might feel compelled to cut back on celebrity-citing after meeting the wistful waiter now serving boldface dish at the Atlantic Theater Company. An employee of a sweller-than-thou London restaurant, this logorrheic fellow, deliciously played by David Pittu, shows up in the enjoyably boisterous production of Harold Pinter's "Celebration" that opened last night. I saw this play and so very enjoyable ... great acting! ... Thanks to Ms Y-McGuinn! Last week's Big Apple Blog Festival was hosted by A Guy In New York. This week's Big Apple Blog Festival is hosted by Harleys, Cars, Girls & Guitars. Living the Scientific Life discovers that beekeeping is popular in New York City. Right in Hell's Kitchen, honey is being produced! Over in Jersey, Mr. Snitch! says: "Human-to-human avian flu variant reported." nyc stories covers the movie version of the play, "Rent." A word of advice: Stick with the play. The blogger behind nyc stories, and the blogger behind Harleys, Cars, Girls & Guitars just completed a week of corporate video shooting. Results to be released at a trade show in Las Vegas in January. To continue the movie theme, Michael Blowhard discusses his conflicting feelings about “The Passenger” by Michelangelo Antonioni. Can somebody explain to me why 2Blowhards features five blowhards? Next week's BABF will be hosted by NYC Stories. however, our other lunch partner, Hans, who is much more experienced, enjoyed the plain desert of apple pie with ice cream ... and he is smiling all the way to the bank ... p/s: we all met at NYU in 1968!!! Each Friday, A Guy In New York publishes "This Week in Reviews (TWIR)," with quick links to New York City restaurant reviews and mentions from the previous seven days in blogs, magazines, and newspapers. A Guy In New York is part of these blog ad networks ... click for more information. Copyright 2005-2010 by Chug Roberts. Some Rights Reserved. in a new browser window.